Further Analysis Of Radiative Forcing By Norm Woods | Climate Science: Roger Pielke Sr.
we presented results by Norm Woods (who works with Graeme Stephens) on the magnitude of radiative forcing for three types of vertical temperature and moisture soundings (tropical; winter subarctic and summer subarctic). Climate Science has summarized this study in the past (e.g., see the May 5th blog entitled Relative Roles of CO2 and Water Vapor in Radiative Forcing). This weblog presents further analyses of these soundings by Norm Woods. The total forcings are evaluated as the increase in flux convergence at the tropopause, and also divided these into the atmospheric and surface portions. As before, these results are for a change from 280 to 560 ppmv of CO2 [Norm presented this values with the same precision as the model output to show that they balanced]. Among the interesting results that he found is that the subarctic winter has the weakest total forcing, but the greatest surface forcing. 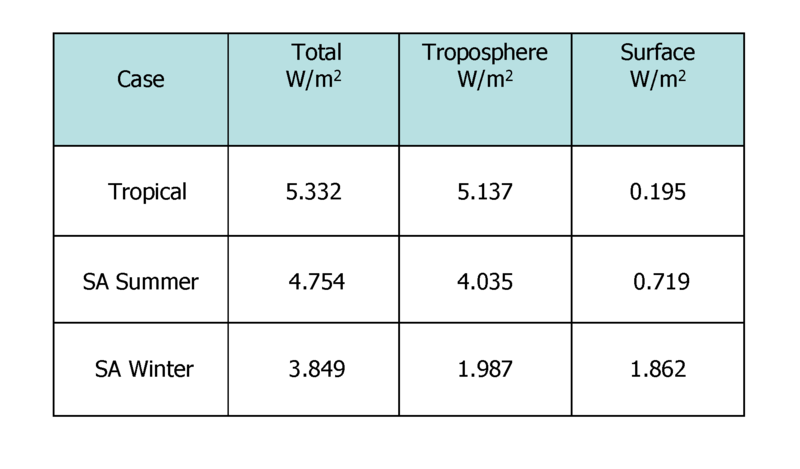 These results illustrate why presenting a single number of radiative forcing as a metric of climate change (such as given in Figure SPM.2 in the 2007 WG1 Statement for Policymakers of the IPCC) is a poor way to assess how the radiative forcing of CO2 and water vapor actually affect weather and other aspects of the climate system. Both the regional and vertical forcing vary geographically and with season, and obviously a global average top of the atmosphere radiative forcing does not capture this important heterogeneity in the climate forcings (also see).